There's very little the MSI Infinite X gets wrong. MSI makes some exceptional hardware. I'm a massive fan of the company's laptop range, especially the GS65 Stealth. If a laptop isn't quite what you're after, then perhaps the Infinite X may be just what you need. The Infinite X is MSI's answer to gamers who want a pre-built machine that's not only powerful enough for latest games, but can also be upgraded at a later date and has a solid design that isn't too obnoxious. Featuring the latest in Intel and Nvidia tech, we're off to a good start, but just how good is this desktop where it counts most? Bottom line: MSI has done a fine job with the Infinite X, if only it could work out a few minor complaints. I've never been a fan of pre-built desktop PCs, let alone gaming rigs. It wasn't long ago that some desktops would come rocking custom shrouds, as well as a host of other "features" that would prevent one from upgrading the machine later or swapping out dead components. I get the reasons behind it (they want you to purchase another model at a later date) but it isn't really consumer-friendly. Those days are long behind us and the MSI Infinite has numerous things going for it that allows me to continue down my path of becoming something of an advocate. These desktops really are the only option for those who simply cannot build their own PCs and don't wish to go down the even more pricey custom build route. The specifications of the Infinite X are impressive. You've got at least an Intel Core i7-8700 CPU, GTX 1070 GPU, and 16 GB of RAM. That makes for an impressive gaming rig — my main custom desktop has a Ryzen 5 and GTX 1070, handing most games on full settings at 1440p. If you have a little more cash to splash, there are even more powerful configurations available with the range-topper rocking a CPU that can be overclocked. MSI opted for a gamer look without going too overboard. Much like its laptops, the company doesn't make the designs of components and other gamer gear too obnoxious. Looking at the Infinite X, you can tell it's a gaming machine, but not one that looks at all tacky. MSI Infinite X is as powerful as it looks — and it looks incredible. There are plenty of vents to allow for enough air to pass through the case and cool the internals. And the side panel can be switched out for the included tempered glass window. If you're all about aesthetics, it's a worthy upgrade and adds that final touch to an already excellent design. There are a few negatives about this glass panel, which I'll touch on later. Overall, it's a great-looking desktop PC. There are even enough RGBs included for maximum gamer effect and a solid carry handle for transporting the desktop to LAN events. 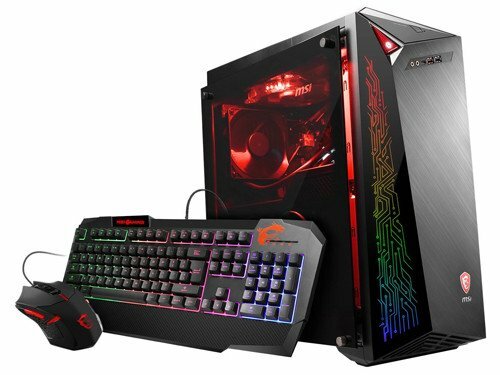 MSI also bundles a mouse and keyboard with the PC; both are mediocre. I could throw out all the synthetic benchmarks in the world, but they don't really mean much when it comes to actual performance in games. You're not going to sit there, gazing at Heaven running all day, are you? Testing various games on the Infinite X, including The Witcher 3, Tomb Raider, GTA V, Ashes of the Singularity, and PUBG, I experienced very little in terms of stutter or dips in FPS. Paired with a very capable Agon monitor with G-Sync (and a refresh rate of 120Hz), it all worked flawlessly. And if you find yourself suffering a little in more demanding titles or wish to move up to 4K, you can simply swap out the MSI GTX 1070 for one of the new RTX cards coming out from Nvidia. MSI makes a big deal about its compartment design, which is said to reduce the amount of heat accumulated within the chassis. The PSU has its own area, as does the GPU, and the remaining components all enjoy plenty of space and cooling capacity. If you're doing a CPU-intensive task, the GPU shouldn't heat up much and vice-versa. It all seems to work just fine as I didn't experience any throttling and that's only with two case fans. Thermaltake could also take a few lessons from MSI on using PCIe ribbon extension cables that actually work. Having the tempered glass side panel is an excellent touch that finishes off the design. Who doesn't want to see the internals of their machine when it's all lit up by countless RGBs? The only drawback to this window is the placement. It's held in by four protruding mounting screws that result in a gap of around 20 mm between the glass window and the main chassis. A few drawbacks prevent this from being the perfect PC. The reason MSI did this was that of the GPU orientation. The metal side panel has a grill to accommodate GPU cooling, but since air cannot pass through glass, the company had to compromise by having the glass stick out on the side. It doesn't look bad (aside from bare metal being exposed), but does allow for dust to more easily get inside. The included CPU blower cooler isn't too good. It's a little too loud for my liking when trying to keep the Intel Core i7-8700 within safe operating temperatures. I would either throw out the rear fan and install an AiO CPU cooler or the tried and tested Cooler Master Evo 212, though installing the latter may prove a little tricky with the GPU shroud. I will note that more expensive Infinite X configurations come with a pre-installed AiO cooler. MSI has done a great job at creating a gaming desktop that I, even someone who isn't a big fan of pre-built systems, wouldn't mind picking up. There are a few design choices I would have reconsidered, especially the tempered glass panel, but overall it has the power to make mincemeat of most games and can even be upgraded. Who should buy this desktop? If you want to get the most bang for your buck, you're going to want to build your own PC, but for those who don't know how or wouldn't mind having a system that has been tested and comes with a manufacturer warranty, the Infinite X is an excellent choice.